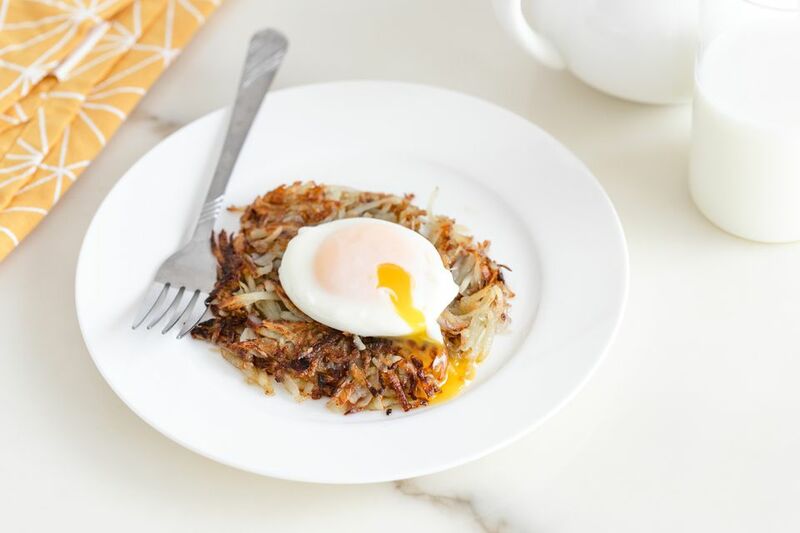 Homemade hash brown potatoes are a great way to start any day! Fry them up and top them with a poached egg or serve them alongside a full breakfast. They make an excellent supper side as well and are especially good with steaks, roast beef, ham, hot dogs or sausages, and baked beans. You might also use the hash brown mixture to make a cheesy hash brown casserole or​ corned beef hash. Peel the potatoes and shred using the large shredding holes on a box grater. Or use the shredding disk of a food processor. Rinse the shredded potatoes and then squeeze or press them to remove excess moisture. Combine the potatoes with the finely chopped onion. Heat the butter and oil in a large heavy skillet over medium heat. When butter and oil are hot, add the potato and onion mixture. Sprinkle the potatoes lightly with salt and pepper. Using a spatula, press them down firmly; do not stir the potatoes. When the bottom is golden brown, turn the potatoes carefully (you might have to turn them in sections) and brown the other side. The hash browns may be kept warm in a 200 F oven until it's time to serve them. The best potatoes for crispy hash browns are high starch baking potatoes, but if you want hash browns that stick together a bit better, use moderate starch Yukon Gold or low starch red-skinned potatoes.